Topics: Find Work, All Vacancies, Allied Health Professional, Health Science Services, Faqs, and Pay Rates. 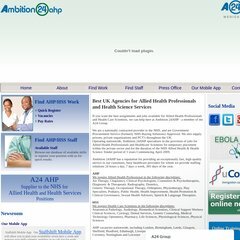 Ambition Recruitment Services Limited (Northern Ireland, Carr) is the location of the Apache/2 server. The programming language environment is PHP/5.2.4-2ubuntu5.10. dns0.easily.co.uk, and dns1.easily.co.uk are its DNS Nameservers. PING www. (178.78.120.40) 56(84) bytes of data.